Got Leftovers? Make Turkey Croquetas! Croquetas (croquettes) are a popular dish from Spain. 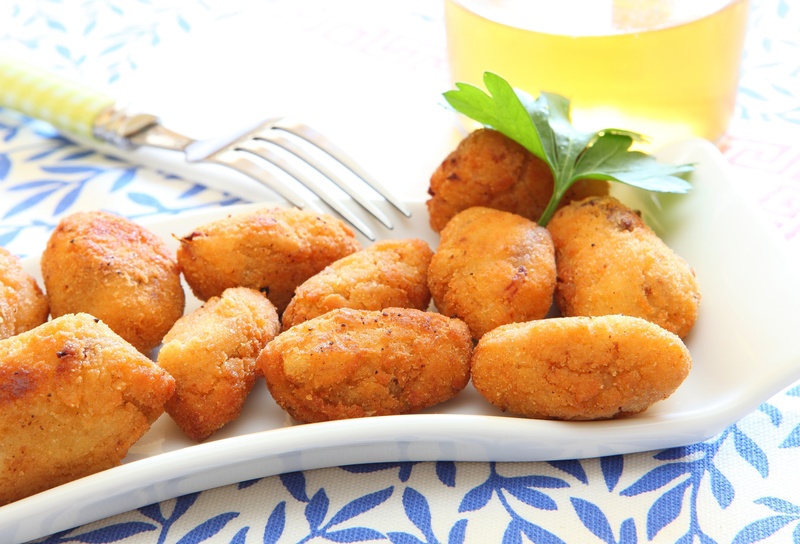 Often served as tapas, croquetas are a great way to use leftover meat. There are many recipes for croquetas but all in general, croquetas are made from minced meat bound with bechamel sauce, covered in egg and breadcrumbs and fried. Traditionally, the bechamel contains butter but we have substituted olive oil. Here is a recipe to make croquetas from leftover Thanksgiving turkey. In a saute pan, heat up 1/4 cup extra virgin olive oil. Add the flour and mix well with onion and oil. Cook for 2 or 3 minutes until the mixture changes color. Add the milk and broth, bit by bit, and incorporate using a whisk. Stir well to avoid lumps. Make sure to do this slowly and stir well. Once the milk and broth has all been incorporated, you should have what resembles a thick, white gravy. Add salt and nutmeg to taste. Strip the leftover turkey meat from the bones. We recommend doing this with your hands and grab all the little bits of meat stuck to the bones. Discard the skin and cartilage. Chop 10 ounces of turkey in a food processor. You can use white or dark meat or a mixture. If you do not have a food processor, chop finely with a knife. Mix the turkey with the bechamel sauce. After mixing, you should have a thick mixture that you can mold with your hands. Allow the mixture to cool. You can refrigerate it overnight or just wait a couple of hours. Take a spoonful of the mixture and roll in your hands to make a small cylinder or a ball. Dip the croquetta into the eggs, and then in the breadcrumbs and set aside on a plate. Repeat until you have about 36 croquetas. Note: Croquetas can be frozen after they have been breaded. To freeze, arrange the breaded croquetas on a tray or plate in one layer, not touching eachother. Put in the freezer. After they are frozen, you can put them in a ziplock bag and store them for several months. Do not thaw before frying. In a small deep frying pan, heat 2 cups of olive oil to 375 degrees. Working in batches, add the croquetas, making sure they are covered completely in oil. Fry until golden, about 1 minute, then transfer to a wire rack to drain. You can double or triple this recipe depending on how much meat you have leftover.